If you've been visiting Bookworm's Cave frequently, you probably already suspect that I intend to read EVERYTHING by Dervla Murphy. I'm slightly less than halfway there at the moment, with eight books read and reviewed (including today's), one waiting on the shelf and only, ehm, fifteen to go. I embarked upon this quest for one simple reason: Murphy's books are amazing. I haven't yet come across an author who would offer such a perfect mixture of readability, sense of humour, vivid conscience, kindness, courage and... well, I could probably continue with half a page of further praiseworthy qualities but I try to avoid monstrous sentences when I can. You surely get the picture. Living in Ireland helps in the quest. 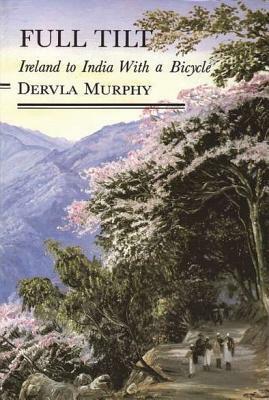 Having been born and raised in Co. Waterford, Dervla Murphy is a bit of a national treasure and as such is fairly well represented in Irish libraries. I said 'fairly', because getting hold of all her books will still take some tracking (and perhaps an Amazon purchase or two), but I'll get there in the end. Howgh! Full Tilt is the very first of Murphy's travelogues. She wrote it in 1963, during an epic bicycle journey from Ireland to India. When I say 'during', I mean it: the book is mostly a transcript of her diaries, written on the go. It was interesting to study the difference between 'early Dervla' and 'mature Dervla'. Her unmistakable style is there from the very start (not really a surprise). So are frugality, skillful use of language and 'Irish charm'. What's missing is a lifetime of experience as a travel writer, visible not in the language itself, but in general attitude. Full Tilt's journey feels like an adventure of a lifetime, not a way to earn a living. As I'm well acquainted with Dervla's stories by now, it gave me funny sense of omniscience, as in 'I know how your life will go from now and you don't know it yet...'. What else is different? There's very little politics in Full Tilt, no typical Murphy-esque activism. At the age of 32, Dervla was already sharply distrustful of the so-called progress and sensitive to injustice, but not yet a fully-fledged activist. Fair enough. Such writing, if it's to have any value at all, requires maturity. When it comes to the book's structure... Let's just say that Murphy improved with age. Full Tilt is marketed as Ireland-India trip, but distance between Ireland and Iran in covered in the first 18 pages, India gets the final 9 and the bulk of the narrative is really given over to Afghanistan and Pakistan. Not a fault in itself, but I felt somewhat cheated (and this is as far as I'm willing to go in criticising Dervla Murphy). The story ends abruptly - too abruptly - but it is continued in Murphy's second book, Tibetan Foothold.